When trying to start my car, the engine cranks, but will not always start. Occasionally, when the engine gets spinning fast enough and I release the key, the car will sometimes catch and start. The vehicle is original using stock harnesses. What could be my problem? A: This problem is commonly found on GM vehicles with stock point type ignition system that use a resistor bypass circuit. 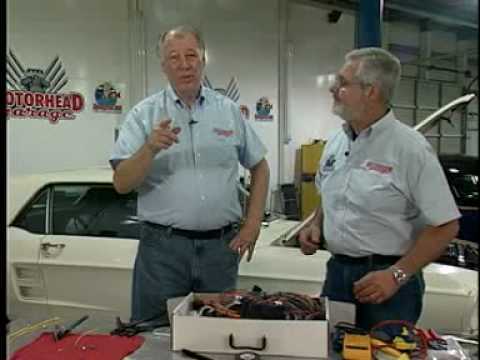 The bypass circuit provides a full 12 volts to the coil when the vehicle is in the cranking position. There are typically two ways that this was achieved. The first, and most common way uses the starter solenoid that incorporates 3 studs (2 smaller and 1 large). One of the 2 smaller ones would be marked with an “R” and would have a wire attached to it that would go from that stud and then up to the positive side of the coil. The second, and more unusual way, was via a secondary blade on the ignition switch which would be marked with an “R” or IGN 2”. Faulty starter solenoid. This only applies when there is a 3 terminal starter solenoid in question. The starter solenoid fails to make a connection between the “S” terminal and the “R” terminal on the solenoid in the crank position. Check for 12 volts on the “R” terminal in the crank position. If there is not 12 volts, replace the starter solenoid. If there are 12 volts present, continue to number 2. No power at the ‘+’ side of the coil in the crank position when there is 12 volts at the “R” terminal on the starter solenoid. There is either a bad crimp on one of the 2 terminals on the bypass wire or there is a break in the wire. Repair or replace the terminals on the bypass wire or replace the wire entirely between the “R” terminal at the starter solenoid and the positive “+” side of the coil. This wire is typically yellow or pink, but can also be green, or black with either a pink or yellow stripe. Faulty ignition switch. This only applies when there is a 2 terminal starter solenoid as the bypass wire comes directly off of the ignition switch in that application. The ignition switch fails to make a connection between the 12 volt battery terminal and the resistor bypass terminal on the ignition switch in the crank or start position. First, check for 12 volts on the bypass wire at the positive “+” side of the coil. If there is not 12 volts present at the coil, check next at the bypass terminal on the back of the ignition switch in the crank position. If there is not 12 volts there in the crank position, replace the switch, as it is bad. If the is 12 volts at the terminal, continue to number 4. This wire is typically yellow or pink, but can also be green or black with either a pink or yellow stripe. If there power at the bypass terminal on the ignition switch, but no power at the ‘+’ side of the coil in the crank position, there is either a bad crimp on one of the 2 terminals on the bypass wire or there is a break in the wire. Repair or replace the terminals on the bypass wire or replace the wire entirely between the “R” terminal at the ignition switch and the “+” side of the coil. Where can I get the right bulbs?